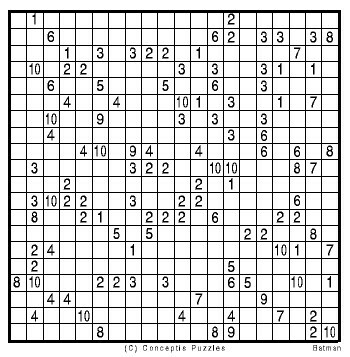 I love puzzles, and a fantastic website is www.conceptispuzzles.com which contains lots of interactive Japanese logic puzzles. Link each number to another of the same number by the same number of squares (ie. pair up same numbers) by drawing a pathway. No pathways can cross and no numbers can be used more than once. Shade this pathway so that the result gives a picture. batman_puzzle and batman_solution are pdf files you can print out nicely of this puzzle.